Today I'm going to share with you some earrings I just finished making. I was playing with some Swarovski pearls and wire. I made some birds nest earrings to sell in my web store. 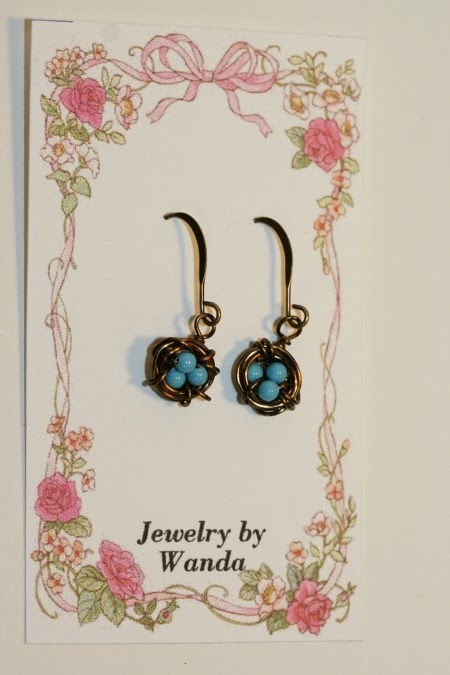 I'm SO looking forward to spring and I thought that some spring type earrings would be fun to make. What screams spring more than a nest with robin's eggs in it? I worked with my camera to get a better photo. This is is the best I can do for a photo. I think it catches the detail in the wire. You can find the earrings here in my web store. I tried to enlarge the photo in the store.